Are you installing countertops and curious about the ECO by Cosentino price in Maryland, Northern Virginia, DC, Baltimore, Annapolis or the surrounding areas? Every countertop installation project is different, custom designed to the individual customer. However, there are certain identifiable factors that influence installation costs. Keep reading to learn about the factors that influence the cost of your ECO by Cosentino countertops and how you can save on installation. Ready to schedule a free estimate? Call us today at 410-712-0601 or click below to contact us online now. What Goes Into the Cost of ECO Countertops? Similar to most other kitchen construction materials, your ECO by Cosentino price of installation is determined after considering many aspects. Homeowners can take control of costs by choosing exactly what they need in the kitchen. If you’re working with a budget, you can limit the amount of detail in the countertops. Kitchen Size: Like with many other materials, countertops begin pricing by square foot. The larger the size of your kitchen, the higher you can expect the installation costs to be. Big kitchens can cut prices by installing smaller pieces of countertop instead of one or two seamless slabs. Countertop Color: While you can expect most colors to be in the same range for prices, there are some specialty shades that can increase the price. For example, seasonal or featured countertop colors typically run for a higher dollar than traditional catalog colors. Finishes: Homeowners tend to enjoy personalizing their countertops for a unique touch. Finishing is an easy way to accomplish a distinguished look. ECO by Cosentino offers two styles of finishing: polished for shine and leather for matte. This adds a textural element to an otherwise simply smooth surface. Edging: Another way that homeowners customize their countertops is with detailed edging. You can select a unique effect such as rounded, squared or semi-rounded edges. Backsplash: Installing a backsplash is a great way to protect the walls in your kitchen, especially if you spend a significant amount of time cooking. The size truly depends on the individual homeowner; some prefer a four-inch backsplash and others want it to reach up to the cabinets. With many countertop materials, you need to worry about protecting the surface from heavy use, stains and scratches. This is not the case with ECO Countertops, a virtually maintenance free material! ECO by Cosentino countertops do not ever need to be sealed, making them easy to clean with just soap and water. This durable surface is stain resistant, scratch resistant and heat resistant (although we always recommend using a trivet or hot pad). 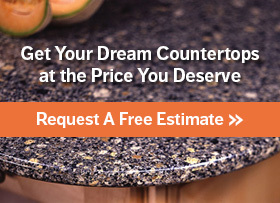 Call Express Countertops for a FREE Estimate! Give us a call today at 410-712-0601 or click here to contact us online to schedule your FREE estimate. Express Countertops serves residential and commercial customers in Maryland, Northern Virginia, DC, Baltimore, Annapolis and the surrounding offers. We stand behind our 7-Day Installation Guarantee, finishing the project within one week of your final decision. Give us a call today to learn more!